Here's another card that features one of the cards from the Memories & More Merry Little Christmas pack which is so great for putting together a quick and easy Christmas card! The cards from the Memories & More packs can be dressed up in so many different ways! In its natural state, the card is white with the black trees printed on it. I simply sponged over it with Crushed Curry, Pumpkin Pie and Elegant Inks, having first masked a circle for a full moon. Once my sponging was complete, I removed the circular mask and lightly sponged a little more Elegant Eggplant ink so that the moon was a little less stark white. I then stamped the sleigh and greeting with Archival Black ink and sponged a little black ink around the top of the card, concentrating on the top corners. 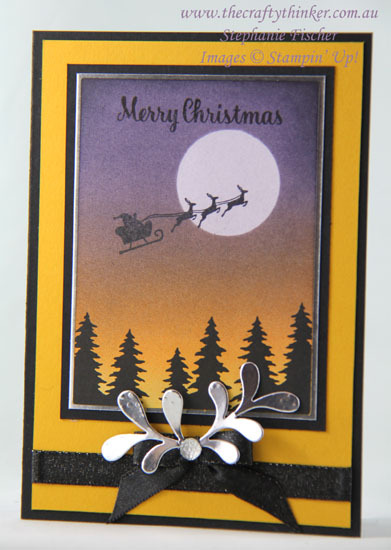 The card layers are Basic Black, Crushed Curry and Silver Foil Sheet. I added some Basic Black Shimmer Ribbon and a couple of Silver Foil Sheet elements cut with one of the Pretty Pines dies and finished with a Clear Faceted Gem.